To clarify, the system is not supported by VMware, so do not use this system in a productive environment. I can not guarantee that it will work stable. As a home lab, or a small home server it should be fine. On previous NUC versions it was required to create a customized Image in order to install ESXi on a NUC. The 6th Gen NUC is equipped with an Intel I219-V Ethernet controller which is listed in the HCL. New-EsxImageProfile -CloneProfile "ESXi-6.0.0-20151104001-standard" -name "ESXi-6.0.0-20151104001-NUC" -Vendor "virten.net"
The AHCI driver for previous NUC versions was always available, but unsupported controllers were not correctly mapped to the driver. Therefore it was required to use the additional sata-xahci package by Andreas Peetz (v-front.de). This is no longer required as the Sunrise Point AHCI driver is correctly mapped since ESXi 5.5 U3 and ESXi 6.0 U1. The 6th Gen NUC is equipped with an Sunrise Point AHCI controller which is listed in the HCL for ESXi 5.5U3 and ESXi 6.0U1 with ahci driver version 3.0-22vmw. 6th Gen NUCs are equipped with a SDXC Slot. Unfortunately, there is currently no driver available for ESXi so it's not possible to use the SD Card slot at the moment. I'm trying to find a solution for that later. The Box contains a short description how to open and assemble the components. The system is a little bit heavier than it looks and has a high build quality. The upside is very scratch-sensitive, so be careful with it. The installation is very simple. Remove 4 screws on the bottom and remove the lid which is also the 2.5" drive holder. 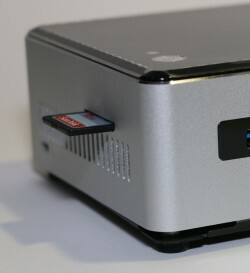 The assembly takes about 5 Minutes to open the NUC, install the memory, M.SSD module and an 2.5" HDD. The simplest way to install ESXi is by using the original ISO and Rufus to create a bootable ESXi Installer USB Flash Drive. While it was already possible to use 32GB Memory on 5th Gen NUCs, it is now fully supported. 6th Gen NUCs support up to 32GB of DDR4 SODIMM Memory. Please note that DDR3 is not compatible with DDR4. They have completely different slots so DDR3 modules can not be used in 6th Gen NUCs. The performance of a single NUC is sufficient to run a small homelab including a vCenter Server and 3 ESXi hosts. It's a great system to take along for demonstration purposes. Currently my NUC (5th Gen vPRO) runs 3 Windows VMs, 4 Linux VMs, 2 virtual ESXi hosts and a vCenter Server with a decent performance. NUCs have a very low power consumption. My i3 NUC with a M.2 SSD and a SATA 2.5" SSD consumes about 28W (idle) - 33W (load). During normal usage the average consumption is about 30W. Have you tried so far to add external (ESXi supported) NIC cards to NUC? There are a couple of (more expencive) USB to LAN cards available that work with ESXi. It was recognized right away by ESXi when i plugged it in my NUC. It's a Sologic 10CM USB 2.0 Ethernet Adapter. I think the power consumption of these new nucs is pretty high. I have a 4th generation (i3 4010u processor) and the consumption idle with esxi 6.0 update 1 and 10VM's is around 10-12Watt powerusage. I only use the msata drive. Any body having trouble getting the sound card to be recognized while running under ESXi 6? What would be the CPU performance difference between a 5th gen i7 and a 6th gen i5? Is it best to buy a 5th gen i7 with 32GB of RAM (not officially supported) Or a 6th gen i5 with 32GB? 5th gen for better cpu perf...but not 32GB support...unless I'm missing something? There are 16GB DDR3 SODIMMs available, but they are rare (as far as I know, only one company makes them at the moment). And they are HUGELY expensive - last time I looked, the 2 SODIMMs were more expensive than the NUC! 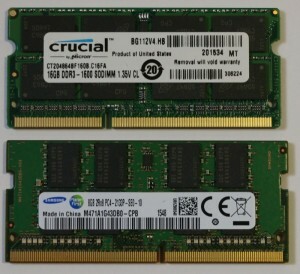 Crucial 32GB Kit (CT2KIT204864BF160B) is at $320,- at the moment. Same modules in DDR4 are $160,-. So yes, NUC6 with DDR4 is a better deal. Anyone having an idea on how to get the sd card reader working in ESXi 6.0? does the skylake bug trouble the system when running several VMs and maybe high cpu utilisation? How is the Intel I3 CPU performing against the I5? The i3-6100U has a passmark score of 3501, compared to 4344 from the i5. I try the last version of VMware ESXi 6, all ok, but when run a VM (Windows Server 2012) the NUC sudden shutdown. Normal? great blogs you have here. I'm looking to replace my homeserver (now still a laptop from 2006) with a NUC. With a few gadgets I threw in the corner for HTPC purposes, I'm now wondering if I could combine it all together with nowadays technology. Looking over several forums online, there's not really a decisive answer yet, so maybe you could help me out. The specs already state that it's a nice home theatre capable device. Intels site also claims VT-x & VT-d support, meaning hardware 3D/video acceleration could be forwarded to guest os's. Do you have any experience with this and how are your findings? Is it still highly experimental for hackers or is it becoming a true viable option? The NUCs are great as HTPC, but if you want to install ESXi on it you have a problem as you can't get the Virtual Machines screen to the HDMI output. If you want to use it as HTPC and run VM on int, maybe VMware Workstation is an alternative. - Find a way to designate vPro's AMT as primary console for ESXi. Chances of getting this done is probably 0 since AMT was not designed for this or it works the other way around. - Wait for Skull Canyon to arrive from Intel http://www.intel.com/content/www/us/en/nuc/nuc-kit-nuc6i7kyk-features-configurations.html and hook up a passively cooled graphics card for 1 of the Guest OS's. But that would be completely overkill + expensive again, also energy consumption almost triples with this beast. I'll look into my options, thanks for responding. I'm was always very happy with the way VMware ESXi can be configured and handled, but VMWorkstation ... then I'd rather have KVM running again. Today I went to the store to exchange the Gigabyte Brix gb-bsi7ht-6500 (6th gen i7) for the Intel NUC6i5SYH. I did this, because the Gigabyte Brix suffered from the issue on the Skylake architecture (Without running any vm's on the ESXi 60% overall CPU load, each core alternately peaking at 100% individually. Gigabyte doesn't have a (bios) fix available. During the unboxing of the Intel NUC I already noticed the huge difference in build quality. After a vanilla install of esxi 6.0.0 update 02 I noticed that the load was a flatliner, all cores average under 0.1%. @fgrehl, have you done some bios or config adjustments to keep the 6th gen running smoothly with ESXi 6? Hi George. I Just bought a gb-bsi7ht-6500. I'm trying to install ESXI, but it's not working. What ESXI image did you use? Where did you got the drivers? I'm having big trouble getting any image to install on my new NUC6i3 box. After reading this I was happy that the drivers would be pre-installed in the image, but every time install fails with no network adapter found. I installed Windows on the box to confirm not a hardware issue and card was fine. Any ideas? The driver is only included in ESXi 6.0 with patch ESXi600-201601001 (ESXi 6.0 Update 1b) or later. What image did you use? I have managed to fix the issue. Checking through the vmkernel.log, I could see the driver module was unable to associate to the NIC, showing "e1000_probe: The NVM Checksum Is Not Valid"
I followed the instructions at "https://thesorcerer.wordpress.com/2011/07/01/guide-intel-82573l-gigabit-ethernet-with-ubuntu-11-04-and-fix-pxe-e05/" to flash a default config to the NIC and all is working! Hopefully this can help someone else who may find themselves with this issue. What other components are required/recommended to fully assemble this home server so it is ready for the ESXi6 installation. Anyone running Windows 2012 inside vSphere on the NUC6i3SYH? Looking for the proper storage driver. It works out of the box for Server 2016 however looking for something for 2012. Thank you fgrehl for your post and inspiration. I just finish my build yesterday and it didn't take much effort at all. I'm a network guy by trade, but a VMware customer for many years now. I didn't need a NUC ESXi box for VMware, but to run Cisco VIRL and GNS3 VMs for networking Labs. My build is NUC6I5SYH, with 32GB HyperX Ram, and a Samsung 950 M.2. Updated the BIOS to 48, and installed ESXi 6.0.0, 3620759. ZERO Issues, completed everything in less than 2 hours, with me takin my time. So again thank you for all the time and effort you put into these post. Thanks you very much for the guide and the effort you have put in. 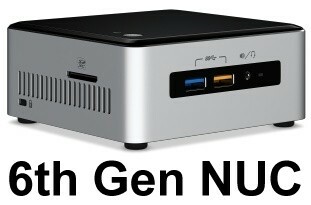 I have purchased nuc 6gen with 32GB to replace my bulky (full tower i7) esxi box and save some $$$ on power usage. I just buy nuc 6gen i5 but i have an issue with USB, how can I use passtrought ? VMware say that "intel corporation usb controller" is not compatible... Are they any driver to change that ? I'm currently using this feature with my n6i5. Working perfectly with APC Back-UPS CS650. Need to use XHCI in the virtual machine setup. Then it just works. I'm looking at one or maybe two i3/i5-6Gen-NUCs for a small lab setup. Reading Amazon reviews I find a lot of people complaining about 6gen NUCs freezing and other stability issues. Did anyone here experience this with the 6Gen-NUCs? Should i prefer the 5gen if i don't need 32 GB RAM? I do not have any stability issues on the 6th gen NUC running ESXi. I'm running a lab with two G6 NUCs and one G5, and I never had any stability issues with any of them. 2) their ability to accept 32GB of DDR4 memory. While fgrehl is right when he says that you _can_ run 32GB DDR3 in the G5, that memory is still twice as expensive as DDR4. And two 16GB sticks right now cost as much as the NUC box itself. So if there is any chance you will need more memory in the future (and I'm willing to bet there is - considering that the VCSA itself will by default it 8GB of RAM :) ), the G6 is more future-proof. And the price is about the same. Sorry for the late reply - the mail to confirm comment subscription was a false positive in my spam filter. Getting it close to 20 degrees will be close to impossible, because i have to keep it in my flat. (Another reason for a NUC.) Anyway i will take a deeper look at the G6 NUCs now. If i hit these thermal issues during the first weeks, i will rma it. I just remembered one more detail which might be relevant - I had no stability issues with my NUCs, but while they're in the lab they're kept at 18-20 degrees Celsius. However, I did experience some black screens/hangs when I took one of them out, installed Windows on it, and kept it next to my TV as a media player. In temperatures exceeding 30 degrees. Is it possible to work with VLAN (802.1q)? I plan to configure a NUC with VMware ESX for some tests. So it would be perfect, if it is possible to put the VMs in different networks, over the same Ethernet-Port. I have a dlink 8 port managed switch that does vlan tagging and I am able to use vlans in the intel nuc esxi install. You just have to configure your vswitch with the correct vlans. ESXi does not generally support any kind of software RAID. Try setting your SATA mode to AHCI. Hi, just wondering if any solution was found so you could use the SD card slot. I would like to install esxi onto that. No. I'm not aware if there is a driver available, and I dont have the skill to build one by myself. I am looking for a New nuc, should i go with the i3 or i5 (32gb ram). I will use the nuc for Microsoft test (ad, sql config mgr..) cisco virl... Do u really need the i5? I just want to say thanks to all of you. After weeks and weeks lookig for the best compromise for a VM Homelab thanks to your suggestions i have my new NUC(NUC6i5SYH) homelab up and runnig. Buy->unpack->bios update->Esxi 6.0u2: Zero issues. Really a good HW. Latest NUC firmware and NUC bios says Turbo enabled@2.9GHz, but ESX still @1.8GHz base CPU. Seems to be a ESXi6 issue. Anyone else the same issue? Just update the nuc with ESX6.0u2 and BIOS version SYSKLi35.86A, but still got the 1.8GHz on the ESXi, while it says 2.9GHz in bios. Installing ova files fails of this low CPU speed. Noticed the same here. This seems like a big deal. Anyone find a resolution to this? I've the NUC with 2 x 16GB Crucial RAM and a Samsung 850 EVO 500GB SSD (no M.2 SSD installed). Hi, I want to build a lab using the AsRock Deskmini 110; i3-6100; 1x 16GB DDR4 2400Mhz RAM; 500GB HDD; 32GB USB 3.0 Stick. This system should work, right? Hello! Why esxi sees only 1.9 Ghz with i5? What interests me is that they can be loaded VM .ova! At this point it is better to take the i3 version of the sixth generation? with i3, esxi should see 2.3 GHz! change anything? Is there a client for the Mac? My workstation is a Macbook Pro. Running a Windows VM or dual booting really aren't good options. Anyone else experiencing really slow transfer rates with their M2SSD (I have a crucial MX300 275GB m.2 SSD). I'm talking about 1.xMB/sec slow transfers (tested through a datastore copy, SCP and building a new VM). I'm about 90% certain that it's a bad SSD but I could be missing something. Intel NUC6i3SYH with ESXi 6.5, Crucial 2x8MB DDR4s, 2.5" seagate 500GB, 7200 HDD, and the MX300 m2SSD. ESXi installed on the MX300. Did you ever figure out what was/is causing the the slow transfer rate? I also have a Crucial SSD, but it's a 2.5 SATA 250gb MX200. Same thing, really really incredibly slow disk access. 2016-12-06T10:11:10.444Z cpu0:65556)ScsiDeviceIO: 2927: Cmd(0x439500969d80) 0x2a, CmdSN 0x13ef from world 65677 to dev "t10.ATA_____Samsung_SSD_850_EVO_M.2_250GB___________S33CNX0HA19408K_____" failed H:0x2 D:0x0 P:0x0 Invalid sense data: 0x75 0x70 0x64. 2016-12-06T10:11:10.445Z cpu3:65559)ScsiDeviceIO: 2927: Cmd(0x4395008ddd80) 0x2a, CmdSN 0x13f0 from world 65678 to dev "t10.ATA_____Samsung_SSD_850_EVO_M.2_250GB___________S33CNX0HA19408K_____" failed H:0x2 D:0x0 P:0x0 Invalid sense data: 0x0 0x0 0x0. 2016-12-06T10:11:12.135Z cpu3:65559)ScsiDeviceIO: 2927: Cmd(0x439500954300) 0x2a, CmdSN 0x13f9 from world 65546 to dev "t10.ATA_____Samsung_SSD_850_EVO_M.2_250GB___________S33CNX0HA19408K_____" failed H:0x2 D:0x0 P:0x0 Invalid sense data: 0x0 0x0 0x0. I think its an ESXi 6.5 thing. I get it on both my whiteboxes (Skylake, SSD) and a Thinkserver (Haswell, HDD) since I upgraded to 6.5. All are using SATA disks and are the stock install with Essentials licence. Problem was smartd - disk monitoring and unsupported commands periodically sent by smartd. It was the starting point for buying a Intel NUC, and install a ESXi, because i always reject to have a desktop computer at home running forever with the esxi. I love the ESXi 6.5 new web interface and the option to not install the vSphere client, not now while configure the base system and adding hdd storage. I have a question, sorry if that annoy you..
Below setup is running under one NUC with nested esxi hosts? or running on multiple NUC boxes? Does anyone know if the ESXi on bare metal NUC can be configured for sleep and wake on lan (WOL)? Thanks. That does help. I recall using such WOL Windows utilities to wake up a Linux desktop in the basement. That was a long time ago. I currently maintain several golden VM images and use copies of them for development and consulting purposes. While its cool to have these at my fingertips and on the laptop or an external WD My Passport USB3 drive, it would be better to have these hosted and available 'On Demand'. All the commercial options are very confusing and expensive. My goal is to have a VMware based platform to host my VMs that would be accessible via Windows RDP. When not in use the, the VM host server should be in 'Sleep' mode. Accessing the ESXi host remotely for maintenance or trying to remote desktop into one of the hosted VMs should be able to wake up the host and connect to the Admin interface or the hosted guest VMs. I can only imagine that others may have similar needs and have such a working setup. I don't think that this is possible. You have to manually (or by Script) suspend VMs and shutdown the ESXi Host. You can then use WOL to wake it up. Please can someone let me know how many machines it can concentrically run on it? There is no real technical that you will hit, besides the 32 VCPU per Core limit. You can run as many systems that will fit into 32GB Memory. Totally depends on your workload. Thank you for a very nice article. I'm currently running ESXi 6.5 on an i3-6100U and it works great! The only thing that just doesnt work is the Hardware monitoring, there are no sensors (just a "No sensor data available" message). Did you manage to monitor any hardware on your NUC? fgrehl, my esxi is going weird with the USB NICs. I will try to explain my self. I install the guetto's driver, bond the three pNICs(1 physical and 2 USB) to the vSwitch0(via web interface). And start doing some test. Copy directly from one VM attached to the vSwitch0 from a NAS. The vmnic0 start to transfer data. Then start copying information from other VM that is begin a firewall from other NAS(through the vSwitch0). The usbnic0 start to transfer information. Some time later, I try to copy again from the virtual machines and usbnic0 and usbnic1 stay idle... only vmnic0 has transfer data usage. OMG the usbnics has disappeared!!!! I try to attach it again to the vSwitch0 and the esxi raise and error with "no nics detected". I try also to do it with the vsphere console and the same result, the nics disappeared. To get again the usb... i need to shutdown and start again the NUC, the reboot 0, don't works. did you get this weird situation on your esxis? I installed ESXi 6.5 UPDATE1 just now on NUC6I3SYH's Samsung SM951, not SATA though but NVMe, it was pretty straightforward, no issues. Sorry, I actually installed it on SATA SSD, for my SM951 it says "not supported / disabled". Going to dig into that, I assume there should be a driver.